Skater is a 7-month-old black male believed to be born around August 2012. A shelter in Oklahoma got a call that there were three puppies tied together with shoestring and tied to a pole outside of a motel in Muskogee. 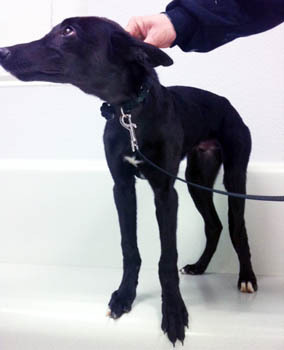 The shelter picked them up, and the "Shoestring Boys" joined the GALT family with help from volunteers in Oklahoma. Skater, HiTop, and Sneaker are most likely littermates, and what cuties they are! Skater has not yet been tested with cats or small dogs.